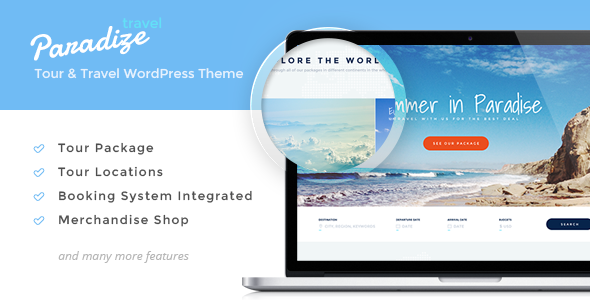 Paradize is Tour and WooCommerce Theme. Ready to use for Tour listing, Tour Location and also online store. You can also sell your tour package, merchandise using WooCommerce ! You can build your own page using Visual Composer, a powerful drag-and-drop page builder that enables you to build custom web pages from scratch in a matter of minutes, without having to write a single line of code. Tour page need WooCommerce add-on / extension called “WooCommerce Booking”. this add-on / extension is not included in this theme. user should buy it separately. Completed with Location features. Locations build with WooCommerce custom taxonomy called “Locations”. Integrated with Contact Form 7 for the Contact Form section. sample Contact Form 7 dummy forms is included.